Thetford Porta Pottie 345 review: is it good for camping? After visiting campsites where the toilets were so disgusting that we were nearly ill even going near them, it was time to investigate something that would help camping for the girls! A camping toilet was called for. Yes, it was a bit of a luxury and the males in the family thought digging a hole or behind a bush would suffice, but the females thought differently. Porta Pottie made by Thetford (model 345). We chose this one because it was a good size for our travels. 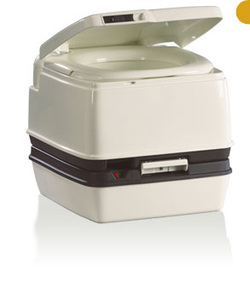 The top tank (water for flushing) holds around 15L and the waste tank holds 12L. There is an indicator on the bottom to advise when the waste tank is filling. We chose the flushing method of the piston as it is meant to be more durable. It costs a bit more, but we are discovering that you get what you pay for! We use BioMagic for the solution that we add to the top and bottom cartridges (environmentally safe, plus a range of other uses should you want to use it). We add 100ml to the bottom tank and 100ml to the top. This is more than is required, but hastens the breakdown of solids and better to use too much than too little (especially if the toilet has heavy use or in warmer weather). We purchased the toilet and BioMagic at Snowys in Adelaide and purchased Thetford Toilet Paper from Rays Outdoors. This is toilet paper that breaks down faster, and is quite expensive, so next time we might just look at recycled toilet paper instead. Others have said this works just as well, and is a cheaper alternative. Our toilet has proven to be a godsend - if we are going somewhere where water is scarce, we fill the top tank with water before we leave, as the top and bottom section can be separated. Plus it is easily cleaned, with parts that can be removed. I must admit that the thought of emptying it for the very first time, had me gagging, but I was pleasantly surprised. There was minimal odour and whilst not attractive to look at, wasn't as nauseating as I anticipated. As it is environmentally safe, when we have been out camping where there is no sullage or toilet to empty it, we have dug a deep hole, well away, from campsites and water sources, and emptied it there and covered up again. Used in conjunction with a pop up tent for privacy, going to the toilet in the bush is a lot better experience for the females (and I must say, the males have been impressed too). If you have any experiences with a camping toilet, you can share them with us!